Miss6 becomes Miss7 on 10th October. We've been doing the countdown for BLOODY AGES. I'm thrilled she can count backwards from such high figures, but really, starting at "68 sleeps to go Mummy!" is a bit much, right? I conveniently timed her conception and birth with school holidays, thus meaning I have zero obligation to hold a birthday party or mass produce cakes for her classmates. Nevertheless, in the past two years I've spent the equivalent of the GDP of a small island nation on her "not a big deal" "it's only going to be a minimal, low key thing" birthday parties. The first time I sat on Ebay while #1Hubby was in Fiji on yet another MOFO work junket, and #1Brother and the #1Grandparents were off drinking cheap cocktails in Vietnam and Cambodia. I was the only idiot left at home, in the middle of winter, with three small children going stir crazy and utterly feral over the school holidays. At home. With me. Every. Single. Day. And so I took to Ebay with wild and reckless abandon, ignoring the kids and going nuts on Dora and Diego everything. Because that was the show on TV when I first started looking, that's all it took for my grey matter to start planning an epic theme party...including a venue with ride on mini steam trains (I have no idea how that part tied in to the Dora and Diego theme). #1Hubby was none the wiser, until the credit card company called him overseas to query why the card was being used in a foreign country (by him) and also online on Ebay (by me)....bastards outed me. Probably for the best that he was able to brace himself in advance, because as soon as he got home from his MOFO junket the parcels started rolling in. Like a tidal wave. A month long tidal wave. The following year, last year, I was super clever and did a movie party. Less effort. Soooo much cheaper. Parents gleefully dropped their kids off for me to shepherd to and from the toilet every bloody 3 minutes during the movie, while they had a blissful few hours of window shopping and coffee in the attached shopping centre. This also cost me a hell of a lot more than expected, as I had to go all "extreme party theme" once again, and buy up every bloody Smurfs item I could find (to match the Smurfs movie they were watching). And so we come to this year. This year I asked Miss6 what she wanted to do, and of course she wants to go to the most expensive place in all the land - The Royal Show. I explained to her that she couldn't have a party there, and couldn't invite her friends. If she really wanted to go to The Show, it would just be us and her - with the twins being unceremoniously but lovingly dumped at Daycare for the day, since they couldn't possibly keep up with our her frenzied game playing, ride...err....riding, display viewing. So we're all set to go to The Royal Show tomorrow. She's never been. I haven't been since I was a kid. The #1Grandparents are coming with us, so I figure they're good for at least an over-priced lunch, and maybe a couple of show bags for the twins. See, I'M SAVING MONEY THIS YEAR PEOPLE! 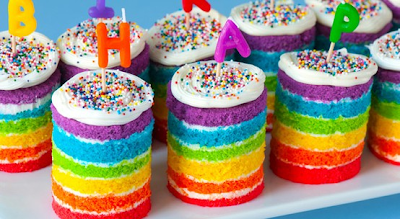 This was my vision, based on making a full sized rainbow cake into mini versions - and then I found the exact Pin to match, with links to the recipe. This is what the whole not a party, party started from. 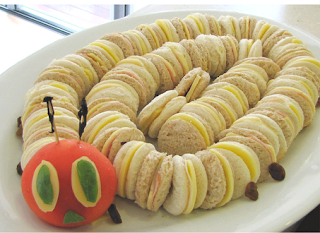 Who can resist a mini-cake? 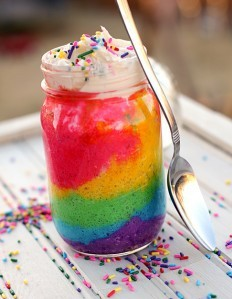 Rainbow cake in a jar...excellent way to offload excess jars to unsuspecting not a party, party guests. Wonder if I can do this in butter and takeaway containers too? And so now I've Facebook messaged fellow school Mum friends to organise the "It's not a party,party play date at the park on Miss6's birthday so that I can wow you all with individual rainbow cupcakes". Or the bulk tray of baby cupcakes from Woolworths if I fail miserably as I most likely will. I'm taking bets on how long it will take me to add lolly bags. In a rainbow theme. And maybe a few games. In a rainbow theme. Which only leads to prizes. In a rainbow theme. Stay tuned, as I'll no doubt have to blog about the epic failure that is my individual mini rainbow cupcakes. 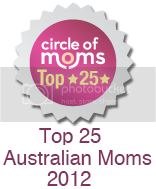 For now, Miss6 just asks that you all take the time to vote for her mother in the Circle of Moms Top 25 Australian Blogs, because I am rapidly sliding into oblivion, and that wouldn't exactly make for a bright and happy Mummy as the hostess of the not a party, party on her birthday. Seamless segue, no? Good news, it finishes in 3 days - so you only have 3 more days of daily votes, and my pathetic pleading and begging and dodgy linking of random stories, images and events to why I need your daily vote! I voted for you (hey, you're #21!!!) 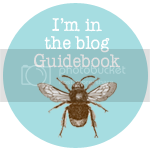 and will do until voting are closed...love your blogs!!! Tricks wants an invite. Well OK, it's really me wanting rainbow cupcake, but let's just pretend OK? Thanks so much Sonia, apprecaite your voting! As for the birthday party....well no pressure, but now I've got Glowless coming to my not a party...party. I'm going to have to pull out the big guns now (and by that I mean covert wine for the mothers to enjoy while the kids play in the fully enclosed playground).